Fabrications. It’s a counter-intuitive name for any scholarly journal: synonyms include ‘inventions’ and ‘lies’. Sophisticated incongruity presumably was intended by the academics conceiving this official organ of the Society of Architectural Historians Australia and New Zealand. SAHANZ launched Fabrications in 1983, at the peak of the postmodern movement, when then-emerging architects promoted their credibility by citing and emulating irony-adroit, text-analytical, forensically sceptical philosophers from Europe. Postmodernism thrived from 1970 to 1990 (Victoria and Albert Museum time frame for its 2011-12 ‘Style and Subversion’ retrospective exhibition). Protagonists hunted and disputed questionable prejudices lurking in words written and spoken across mainstream Western culture. Influenced by Marxism, they swooped particularly on ideas likely to disenfranchise society’s underprivileged minorities and outsiders. Today’s outcome of their arguments (proving the classic Hegelian process of thesis, antithesis and synthesis) is a new domain of history-theory scholarship, an alternative ladder for counter-conventional academics to clamber. Historiography was the rationale misused by some of SAHANZ’s most prominent scholars to reject the first comprehensive biography, chronology, catalogue of works, contextual essays and bibliography of Douglas Snelling’s contributions to ANZ’s architecture and design history. Davina Jackson’s 2004-07 RMIT PhD thesis, Douglas Snelling: Pan-Pacific Adventures in Modern Design and Architecture, was compiled as a narrative history – concluding with a section of political analysis to place Snelling’s points of significance against those of other practitioners across his main disciplines of achievement. Narrative history generally is descriptive, chronological and/or categorical in its treatment of facts and events. It deals with people and not abstract concepts. After journalism (reporting ‘as it happens’), narratives are the necessary next chronicles about any historical subject. Only after these basic reports are written can historiographers argue their esoteric figments; plucking angles from the primary researchers, exploiting theories and interpretations from their personal choices of eclectic other sources. Four leaders of SAHANZ – all with experience as editors of Fabrications – used historiography to rationalise (to their academic colleagues and for the historical record) their decision to fail Jackson’s Snelling history thesis. The naysayers were RMIT architecture school administrators Harriet Edquist (Jackson’s lead supervisor) and Richard Blythe, and two of their chosen three external examiners: Christine McCarthy of Victoria University (Wellington) and Andrew Leach of the University of Queensland and now Griffith University; he also was educated at VU Wellington. Attacks on all Jackson's academic positions and projects intensified across all of Australia's architect-influenced establishment power bases following her 2005 selection by Phaidon, publishers of prestigious art books, as one of the world’s top architecture critics for its 10 x 10_2 survey of 100 21st century architects. In 2005 she also was appointed by the University of New South Wales as an associate professor advising Deans of three faculties on trans-disciplinary potentials. And she finished chairing the national task force which brokered a newly productive relationship between the (R)AIA and the Australia Council after 20 years of their regular failures to co-operate on exhibitions in Australia's national pavilion at the Venice Architecture Biennales. All these achievements caused her to be blacklisted from Australia's architecture and research institutions. By 2006 Jackson's offers of articles and conference papers to leaders of SAHANZ and DOCOMOMO had been rejected, her SAHANZ membership notices had evaporated, and Edquist had quietly removed her from RMIT's student roll (later reinstated). Members of SAHANZ and the (R)AIA persuaded UNSW's Chancellery (via their control of its Faculty of the Built Environment) to first ban her from teaching architecture students, then to pay out Jackson's five year professorial contract in 2007. Presumably infected by these widespread negativities, Edquist, Blythe, McCarthy and Leach misinterpreted RMIT’s written instructions to candidates, supervisors and examiners that PhD architecture theses must provide ‘significant knowledge of fact and/or theory’. All three of Edquist’s external examiners (including Peter McNeil, then working in Scandinavia, now at UTS) acknowledged the extent and calibre of Jackson’s original research. However McCarthy and Leach, the two Wellington-educated examiners, found that Jackson’s narrative history format was insufficient and the absence of historiography (ie. Jackson’s refusal to consign her primary factual content to an appendix and ‘engage with’ general literature about ANZ modernism by other SAHANZ scholars) was unacceptable. Reading Fabrications journals clarifies that SAHANZ fosters a ‘close profession’ (often termed a ‘closed shop’) that is sustained by career-enhancing collusions among a privileged few senior and emerging academics on staff at ANZ architecture schools. Mutual promotion is standard currency among the clique of SAHANZ salary-earners who are allowed to publish in the once or twice yearly Fabrications issues. One pertinent example is Andrew Leach’s glowing review of the 2012 Encyclopedia of Australian Architecture edited by Philip Goad and Julie Willis at the University of Melbourne ... following Goad’s diplomatic critique of Leach’s treatise What is Architectural History?, published in 2010. These two books (from respected Cambridge, UK, publishers) express different approaches to architectural history. Goad and Willis collated factual and chronological narratives (sub-edited by Kim Torney), while Leach wrote a historiography primer to 'inflect' architecture students with postmodern strategies for ‘critical’ reading. Goad wrote that Leach's book lacked recognition of various important earlier writers on architectural history. And if Leach had applied his historiographic arguments for failing Jackson’s Snelling thesis to the Goad and Willis encyclopedia – both documents being compilations of historical information without comment on extraneous literature – he would have demonstrated incompetence at clarifying different scholarly writing genres and a personal aversion to primary historical research. He (and McCarthy) succeeded with their misinterpretations in Jackson's case because they recognised – and shared – a desire among their SAHANZ colleagues to hold the fort and raise the drawbridge against Jackson's intrusions on their hallowed ground, troubling some influential participants in the club's stable pecking order. At the top of its status pyramid is Philip Goad, the SAHANZ leader whose published scholarship most obviously would be threatened by Jackson's Snelling history thesis (after he earlier gazumped her book on circa 2000 Australian architects). Goad has spent much of his academic career promoting Melbourne's leading mid-20th century architects as Australia's most important interpreters of California modernism. He has correctly agreed with earlier critic Robin Boyd that the work of Melbourne's modernists mostly compares to the Europe-influenced architectural works and culture of northern California and the eastern US. Because of Melbourne's sub-Antarctic weather, its architects could not deliver swimming pools and the other symbols of decadent sub-tropical living invented in southern California. Climate is a core reason why Douglas Snelling's Sydney works, including the world's second Lautner-style infinity pool, will earn him recognition from future historians as the most accomplished Australasian interpreter of 'the California dream', as it is popularly understood via the sprawling, sparkling houses of Los Angeles and Palm Springs. Goad wrote about 'the California dream' in his unpublished early 1990s PhD thesis on Melbourne architecture 1945-75 but Jackson was prevented from reading these chapters when she studied his thesis (restricted access) at Melbourne University's architecture library in the mid 2000s. Scanning Fabrications articles published during the 2000s illuminates the key political and research priorities that concerned the four official deniers of Jackson's Snelling thesis, and their history/theory colleagues. 1. Jackson’s lead supervisor, Harriet Edquist, confounded her claim that Snelling’s career was ‘not worthy’ of analysis by publishing a book promoting Michael O’Connell (1898-1976). This English amateur watercolourist and designer of concrete ornaments and textiles lived in Melbourne during the 1920s, where he pioneered concrete construction for his house in Beaumaris. Edquist subtitled her O’Connell biography ‘The Lost Modernist’, but in a Fabrications review, NZ historian Douglas Lloyd-Jenkins clarified that her subject (who he misnamed as Michael O’Connor) was not legitimately part of ‘the canon’ of architecture and would not ‘find a seat on the bus’ with Australia’s best mid-century modern designers. As with Edquist’s earlier PhD thesis/biography on significant Melbourne Edwardian architect Harold Desbrowe-Annear, the O’Connell biography did not include any historiographic analysis. Would her publications have been rejected by her choice of examiners for Jackson’s Snelling work? 2. Examiner Christine McCarthy published articles on 19th century wallpapers and the American and Australian experiences of English-born, NZ-bred architect Edmund Anscombe (1874-1948). Anscombe built extensively in New Zealand during the early decades of the 20th century – and died the year that Snelling started his architecture practice in Sydney. McCarthy did not mention Snelling in her article – perhaps because he is destined to overshadow Anscombe as NZ’s most accomplished expatriate 20th century architect and designer. McCarthy’s writing also contained no historiographic discourse – despite her insistence that Jackson’s Snelling thesis must have a historiographic ‘framework’. 3. Examiner Andrew Leach co-edited Fabrications 2006-2009 – avoiding publication of the Douglas Snelling research that he and McCarthy were then examining. 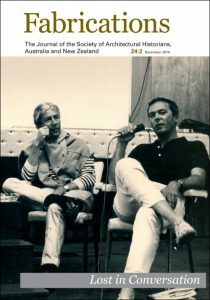 Leach also co-edited two books of academic essays: Architecture, Disciplinarity and the Arts (with John Macarthur) and Shifting Views: Selected Essays on the Architectural History of Australia and New Zealand (with Antony Moulis and Nicole Sully). In a 2004 edition of Fabrications, Leach published his research on Helmut Einhorn (1911-1988), a German engineer, architect and town planner who arrived in Wellington in 1939 and designed notable public buildings and infrastructure for the NZ Ministry of Works until his retirement in 1976. Leach’s brief summary of Einhorn’s life and oeuvre as a public servant was supplemented by approximately 1000 words of historiographic comment on ‘dislocation and modern architecture in New Zealand’, with extensive endnotes. 4. RMIT administrator Richard Blythe did not publish any substantial modernism research in Fabrications during the 2000s. He was a prominent academic in Tasmania before joining RMIT, and chair of the (R)AIA's national education committee – so in charge of its mechanism for controlling Australia's university schools of architecture (a subject about which he wrote in Fabrications in the late 1990s). Since the early 2o00s, Fabrications has included more frequent articles on ANZ connections to American modernism than was evident in the 1980s and 1990s. Most of these are diminished by their ignorance or avoidance of Snelling – so he remains a ‘missing link’ among Asia-Pacific interpreters of California modernism. — Julie Willis and Philip Goad’s 'A Bigger Picture: Reframing Australian Architectural History' (ironically calling for a wider and more inclusive coverage of Australian architecture). — Philip Goad’s 'Constructing Pedigree: Robin Boyd’s ‘California-Victoria-New Empiricism’ Axis'. — Gevork Hartoonian’s 'Critical Regionalism Reloaded' and 'Harry Seidler: Modernism Revisited' (both relying on incomplete earlier books by Jennifer Taylor). — Paul Walker’s 'Here and There: House and Nature in New Zealand Architecture' and 'Migration and Modern Architecture: The Case of New Zealand'. — Philip Goad’s review of New Dreamland: Writing New Zealand Architecture, edited by Douglas Lloyd-Jenkins. — Andrew Wilson’s review of Group Architects: Towards a New Zealand Architecture, edited by Julia Gatley. — Mike Austin’s 'Kiwi Architecture: Modernism Recycled' and 'Pacific Island Architecture'. — Paul Memmot and James Davidson’s 'Indigenous Architecture of the South Pacific Region: 25 Years of SAHANZ Research' (where Snelling’s pseudo-thatched rooflines could have been noted). — Robin Skinner's 'False Origins: The Group, California and the Desire for Indigeneity'. — Paul Hogben’s 'Architecture and Arts and the Mediation of American Architecture in Post-War Australia' (which includes a mention and press clipping about Snelling’s 1955 House of the Year Award but otherwise emphasises Snelling’s key rivals of that time). Approximately 20 SAHANZ writers on ANZ and California modernism now are diminished by the absence of Snelling in their key texts that post-date general knowledge in SAHANZ of Jackson’s research and writings. They seem to have been duped to join group-think processes that American critic Noam Chomsky might describe as 'manufacturing consent'. Jackson suggests that examiners McCarthy and Leach were infected with their anti-Jackson/Snelling sentiments via two Wellington-educated modernism historians who moved to Melbourne in 2000: Paul Walker (still working with Goad at the University of Melbourne) and Walker’s partner, Justine Clark (a former historian at NZ's National Library, who succeeded Jackson as editor of Architecture Australia and now edits Parlour, a blog currently bemoaning the 'half-life' of women in architecture). Walker and Clark had overlooked Snelling in their 2000 book Looking for the Local: Architecture and the New Zealand Modern. Because SAHANZ still is controlled by today's generation of academics who rebuffed the Snelling PhD, younger modernism scholars cannot comfortably promote Jackson’s research (especially not to blind examiners of their forthcoming theses). Young and future historians unwittingly must breathe a long white cloud of noxious toxins from this trans-millennial, trans-Tasman travesty. * Jackson's 1997 UNSW M.Arch thesis – @home: Another Revolution in Architecture's Theory of the House (a historiographic analysis of architectural literature on designing and occupying domestic spaces) – is available as an ebook via Amazon's Kindle store.